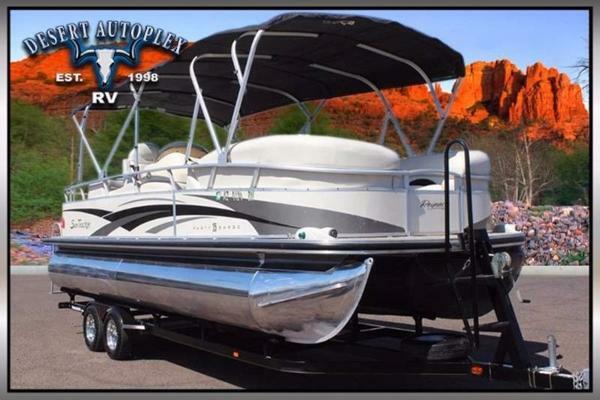 2003 Sun Tracker PARTY BARGE 25 Regency Edition Few pontoons can match the solid construction, luxurious appointments and great overall performance of the PARTY BARGE 25 Regency Edition. 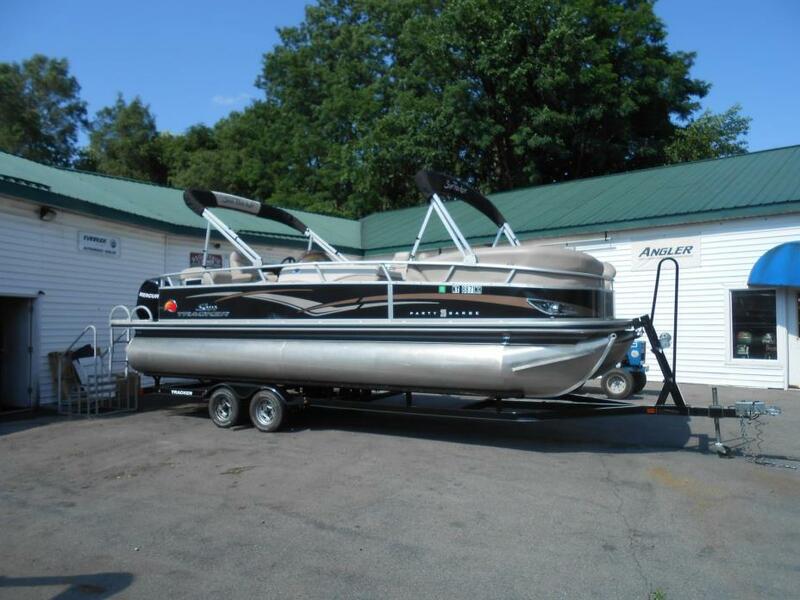 The all aluminum DURA-DECK and oversized 26-inch pontoons provides a stable platform for a party-to-go! That can make anyone hungry. So you?ll appreciate having a sink and counter for fixing meals and a table for eating. Afterwards, lie out on the padded sun deck and work on your tan while you listen to tunes on the AM/FM/CD sound system. 2011 Sun Tracker PARTY BARGE 25 Regency Edition 2011 Sun Tracker Party Barge 25 PB-25 Regency Edition with 90 hp Mercury 4 stroke motor with only 55 computer verified hours, very plush couches and recliners, nice stereo system, large bimini top, docking lights, changing/potty room, rear sun deck, tandem trailer, very nice boat for $25,900 at Boat Sellers. Factory Info: The newly contoured SUN TRACKER PARTY BARGE 25 Regency Edition, with Mercury power, maximizes upscale features with a luxurious design. Families will enjoy its convenient extra-deep cushions & higher seat backs for all-day comfort, Sirius-capable AM/FM/CD with MP3 jack, padded sundeck with pop-up changing room, retractable bow mounted boarding ladder, movable table, and aft swim platform with oversized boarding ladder. True to its namesake, the stylish Regency Edition sports a custom console with an oversized helm seat, elevated helm station for maximum visibility, 26" diameter multichambered pontoons for a smooth ride, NV Performance Pontoons, and color-matched 11' Bimini top. 2008 Sun Tracker PARTY BARGE 25 Regency Edition 2008 Sun Tracker Party Barge 25 Desert Autoplex is pleased to bring you this Regency Edition Pontoon Boat!! 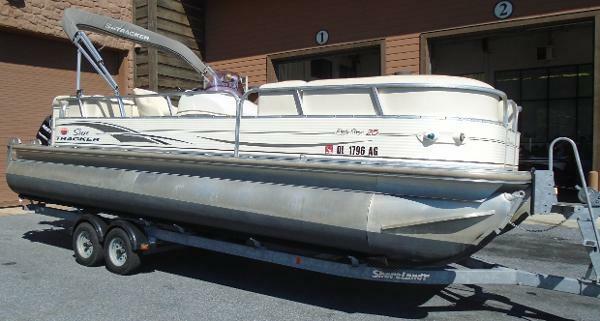 This boat is outfitted with a Mercruiser 3.0L TKS motor with a Mercury Alpha One drive. This boat starts and runs perfectly with absolutely no issues. This boat had some minor fade on the seats so they were completely redone!This boat gives you some other great options including:* Pilot and co-pilot seats* Rear L-Loung seating* 2 Bow bench/lounge seats* Rear tanning deck* Standard boat Gauges* Sport tilt steering wheel* Depth gauge* Pop-up changing room* Rope cleats* Bimini top* Clarion CD sound system* Under seat storage wells* Rear swim ladder* Counter with sink* Floor carpet* And moreThis boat is perched on a dual-axle Tracker boat trailer with alloy rims wrapped in a set of Carlisle 205/75D14 Sport Trail tires. The trailer has been serviced and is road ready. We have just completed the annual service on this clean 2008 Sun Tracker Party Barge 25 Regency Edition Pontoon Boat. 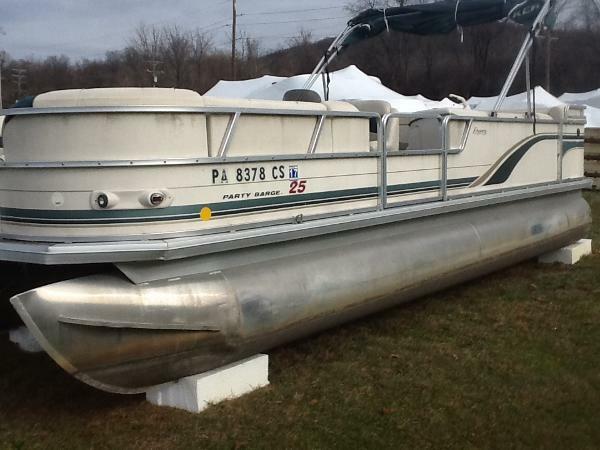 Don't miss your opportunity to own this amazing party boat. You can buy with confidence!Financing is always available on approved credit. We have recreational lenders to work with and we offer rates from 6.5%/144 month term (O.A.C.) and can work with any past or current credit situation. We offer a secure credit application for fast and easy credit approval. 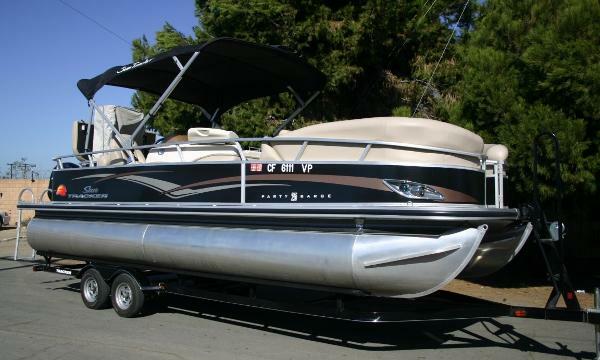 2007 Sun Tracker PARTY BARGE 25 Regency Edition THIS UNIT IS FULLY SERVICED AND READY FOR THE WATER TODAY! ALL SYSTEMS ON THE BOAT, MOTOR AND TRAILER ARE FULLY FUNCTIONAL, SEATS ARE SHOWING SOME FADING BUT NO TEARING AND STICHING IS GOOD. Our luxurious PARTY BARGE 25 Regency Edition artfully mixes upscale features with maximum versatility. Owners will make good use of its convenient entertainment center with freshwater pump, sink, Sirius-capable AM/FM/CD with MP3 jack, padded sundeck with oversize pop-up changing room and bench, plush lounge seating with integrated storage, moveable table, trash receptacles, and aft entry platform with oversized boarding ladder. True to its namesake, the Regency Edition sports a custom console with deluxe helm seat, quiet pressure-treated 0.75-inch thick, 102-inch wide deck, 26-inch diameter multichambered pontoons for a smooth ride, and color-matched 11-foot Bimini top. Mercury outboard power with Mercury controls.